I am 17 weeks pregnant today. My weight has increased tremendously the last few weeks. My trousers are getting tighter by the day and my most of my tops no longer fit. My appetite is back and trying to not eat for 2 has become a real struggle. I took a week long leave last week and I now know that pregnancy and staying in the house can never work for me. I was so lazy and slept most of my days away while watching TV. Needless to say, I suffered all the pregnancy pains from muscle aches to headaches. It is true that you have to stay active if you are to survive the nine months and come out the other side in one piece. One of the struggles I had with my last pregnancy was sleeping comfortably at night. Already, I cannot sleep on my back and the right side is also not recommended. And because sleeping on my belly is a no-no and practically impossible at this point, this leaves the left side only. The fact that I cannot turn makes me wake up more tired that before I went to bed. 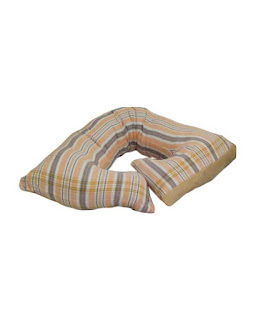 I’m looking into buying a pregnancy pillow for belly and back support. Though I was searching for a U-shaped contoured full-body pillow, the only one I could find on Jumia was this smaller version of it. I’m yet to figure out what goes where, and the one image they have of it in use is not much help either. If push comes to shove, I’ll have to give it a try. Our next pre-natal clinic is this Friday. We’ll also do a scan the same day to see whether everything is okay in there. And now I’m hungry.